As we continue to hear back from this years' Haiti team, we will be hearing a little more from Lorna Woroniak on some of the interactions that she was able to have with students in her English Language class. We are excited to hear from Lorna how many of the students she worked with are setting goals for their future, please pray for these students this week as we continue to seek God to build up future leaders within the community of Gens de Nantes. I was excited and blessed for this opportunity to return to the community of Gens de Nantes, Haiti for my fourth visit, and my second time serving on an English Teaching Team. As I prepared for the trip I was looking forward to renewing acquaintances with those I had met on previous visits, and especially eager to see some of the students I had met in 2016. I wondered how they had been developing in their English studies as well as how they were getting on in life. I also anticipated meeting new students who were anxious to learn English. God provided me with lots of opportunities, in various ways, to renew friendships and make new acquaintances. One unique way was through the Dialogue Journals that we teachers exchanged with our students. Each teacher was assigned several students to ‘dialogue’ with during the span of our teaching time in Haiti. These Dialogue Journals allowed us to communicate on a personal level with our individual student and ask questions about their life, family, and plans for the future. They in turn would write their replies to our questions and ask some questions of their own. 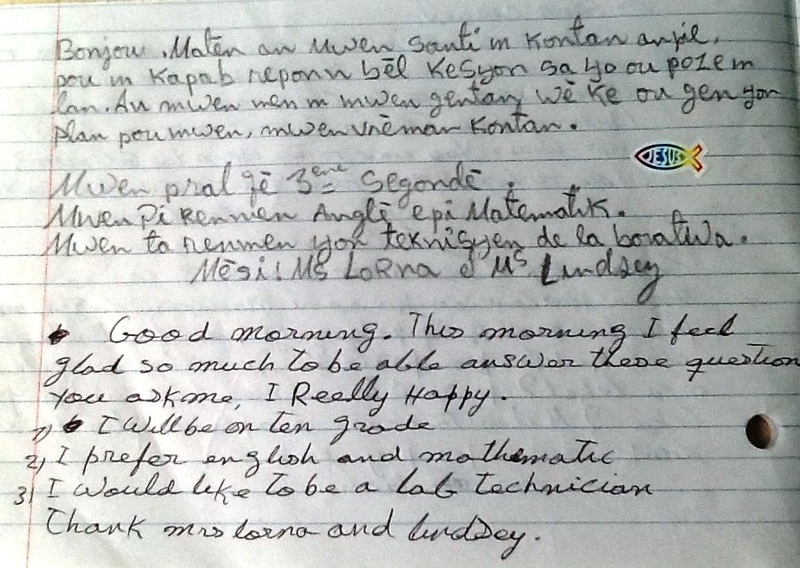 Each journal entry was translated from English to Kreyol and vice versa. This task kept our translator, Willy, very busy but it meant that the messages could be read and understood in the language each one was most comfortable with. Another benefit to having the messages written in both languages is that it would become a good practice aid for the students to keep. On our first day of class one student showed up with her journal from last year clutched in her hand. We were so touched to see that she had kept it safe and that it was valuable to her. Another student was so anxious about their journal they came prepared with a list of 51 words that they wanted translated into English just so they could practice them with a friend! These journal conversations were such a valuable tool for getting to know each student as an individual and understanding how I could pray for them, both as their teacher and after I returned home. Many students expressed their deep desire to learn, and have set goals for their future. Their messages often included words of thanks and appreciation to us for coming to help them learn. My journal responses provided encouragement for them to follow their dreams and to always listen for God’s voice and direction in their lives. He has plans for them! He is their friend and can always be trusted. Each of the students now has their Dialogue Journal to keep and to reflect on. I have the gift of being able to pray for them to affect change in their community and country, and for God to guide them in their future goals to become doctors, nurses, agronomists, lab technicians and evangelists. These students are the future of Haiti! I am thankful to God that I had the opportunity to make a small investment in that future. It is so exciting to see when someone is truly beginning to learn English. They are writing and talking.It warms the heart. 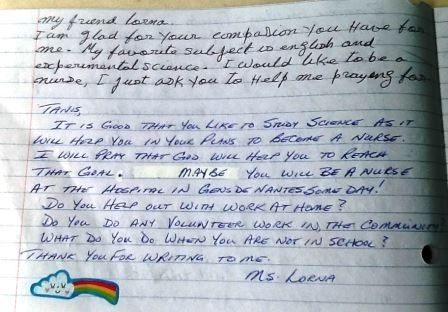 Hi Lorna, The Lord has certainly picked the right person to guide these students to a better future. Your compassion for the people of Gens de Nante moves me as I also pray for them. Many blessings and hugs to you for all that you do in the name of Jesus!